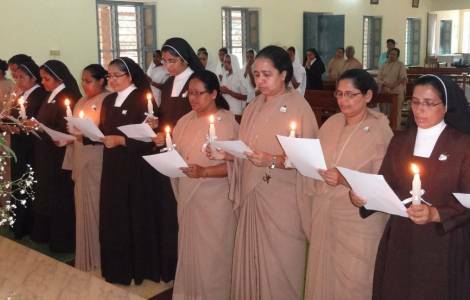 Bhubaneswar (Agenzia Fides) - "The anti-Christian massacres of 2008 did not discourage me, but rather encouraged me to follow Christ": this is what the three new nuns of the Institute of the Carmelite Sisters of Saint Teresa (CSST) said, who made the solemn profession on 8 April in the Indian state of Orissa. We are talking about Sr. Rajani Ekka, Sr. Kristina Pradhan and Sr. JananiPradhan. Over 500 faithful were present at the liturgy which was celebrated in the Catholic Church of St. Paul, in Balliguda, in the district of Kandhamal, and presided over by Msgr. John Barwa, Archbishop of Cuttack-Bhubaneswar. Anti-Christian massacres were carried out in the district of Kandhamal in 2008 which caused 100 deaths and 50 thousand displaced persons. "God has called you at the service of his Kingdom, with your commitment and dedication you will be able to do God's will", said Msgr. Barwa in his homily, underlining the virtues of "patience, perseverance, hope in the Lord", which animated the five wise virgins in the Gospel of Matthew. Sister Kristina Pradhan, 32, from the Parish of Kurtumgarh, was the victim of anti-Christian violence in 2008: at that time she was a postulant in her religious institute. She told Fides: "I saw the pain and agony of my people, persecuted and tortured in an inhuman manner, and killed for the love of Christ. This really encouraged me to remain firm in the faith and today I receive my perpetual profession". Sister JananiPradhan, 32, comes from a parish of the Jesuit missionaries: "Neither fear nor threat could induce me to renounce my faith.The pain and agony of anti-Christian violence rather determined me to persevere in my vocation to religious life" she said.